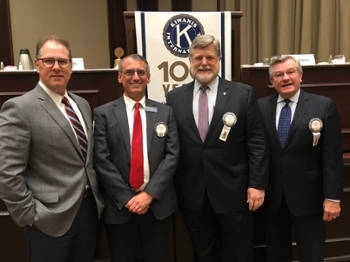 Darin White, Executive Director of Samford University’s Center for Sports Analytics, served as the keynote speaker for the Kiwanis Club of Birmingham’s meeting on March 20. During the presentation titled “How Big Data is Fundamentally Changing the World of Sports,” White focused on how analytics are changing sports and how they are impacting the way games are played. The Center for Sports Analytics, established in 2017, is a one-of-a-kind, university-level center seeking to promote the ethically-centered, rational inquiry into issues at the burgeoning intersection of big data, analytics, and sports. White went on to discuss the three general purposes of the Center: to sponsor educational activities, provide a forum for industry professionals and students to learn about sports analytics, and to foster growth and innovation in sports through analytics. At the lunch-time meeting, White touched on how the Center is helping Birmingham: it provides a new way to attract top students to the area, builds relationships in the sports industry, and gains international exposure for Samford and for Birmingham. In his speech, White appealed to the crowd when telling them about a project his students recently completed which was to determine which sports team is really most dominant in terms of fan base size in the state of Alabama: University of Alabama or Auburn University. White was introduced by fellow Kiwanian and Samford’s Director of Athletics Martin Newton and was also joined at the head table by former Kiwanis President, Vice President for Business and Financial Affairs, Buck Brock. Learn more about the Center for Sports Analytics.